I have been deveveloping software professionally for over 12 years, having divided most of my career to date between working on high-performance video and statistical analysis tools for premier sports teams, with an emphasis on the NFL, the NBA, and Division 1 NCAA Football and Basketball, and most recently, consulting. I have had the opportunity to work with various .Net technologies including Silverlight, WPF, WinForms, ADO.Net (with SQL Server 2005), COM Interop, C++/CLI, DirectShow, Web & Windows Services, MSBuild, and Visual Studio Team System. I am currently employed by Wintellect as a Senior Consultant. I attended the University of Florida and pursued an Engineering degree in Computer Science. While there, I got involved with Sports Video, just before the advent of the large-scale use of digital video in this field (up to this point computers were involved, but they were used to batch-control tape decks.) UF Football was one of the first collegiate teams to pursue a digital video solution for their coaching analysis, and I was lucky to be able to participate in the research and selection process (we chose the Avid Technology SportsPro solution over the competing Montage Omega and Home Team Advantage products.) After graduation, I followed this field through a graduate assistantship with the University of Illinois Football program, where we served as one of the first two beta test sites for the LRS Sports Video editing package, and with the arrival of new head coach Ron Turner, became once again a SportsPro customer. While at Illinois, I supplemented their Game Analysis reporting software with a custom-written solution to provide more detail for their post-game self-scout efforts. Following the 1997 season, I joined Avid Sports to do software development work in their QA department. From there I became a developer on their Media Statistics development team, responsible for the client and server report generation packages. During this time Avid Sports was sold to Pinnacle Systems (except for the division that I was working for.) Shortly after the sale I joined the Pinnacle Systems Team Sports development team, initially working of several features within the SportsPro suite. 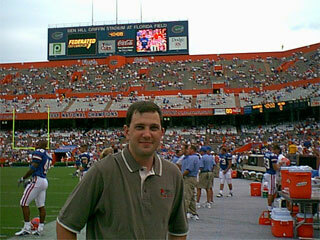 In 2002 I switched over to become the primary developer on a new editor for different sports markets. Then in 2004 I moved over to work on core technologies that would be shared across several product lines, including design of a new video processing engine. In February of 2005, XOS Technologies acquired the Team Sports division of Pinnacle Systems, where I divided my time between these core video technologies and work on backend server tools. In August of 2008 my involvement with Sports Video ended and I joined Burntsand as a Senior Consultant. After 10 years in one market, I felt my best opportunity was to to get as much visibility as possible into many different facets of software development. With Burntsand I was able to participate in several projects of varying sizes, including an enterprise solution for streamlined purchasing for a Fortune-500 retailer, a logistics management application for a small datbase appliance ISV, and a decision-assistance application for an international insurance company. In July 2010 I left Burntsand and I joined Wintellect’s consulting arm. My current areas of focus include client presentation technologies (WinForms, WPF, Silverlight) and emerging technologies such as Azure and .Net 4 and Visual Studio 2010. I also speak frequently at local Development Community events including Code Camps in New Hampshire, Vermont, and Massachusetts as well as at local user groups. Hi John, I have begun to try to translate your book “Windows store apps succinctly” to Spanish, so that more non-English speaking people can enjoy your work. I enclose the front pages, to tell me what you think, and if more people like the idea and want to help, the better.